I don't know about you, but I have been seriously enjoying the beautiful weather we have been having lately. Sunny afternoons, melting snow, and stable river conditions have made for some great opportunities for anglers to get out there on the water. 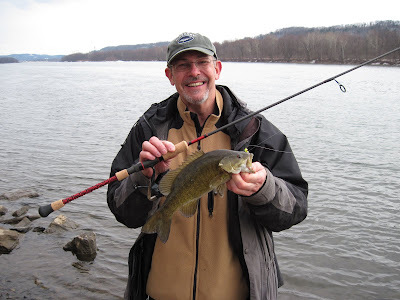 Fortunately for us here in central PA, our local fish have been enjoying the weather lately as well. This past Tuesday, my Dad and I hit the river for a few hours. 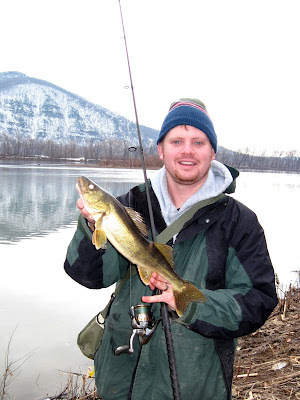 We fished a portion of the river that neither of us had been to for a while, and it was our hopes that some new fish had moved into the area and the bite had turned on. My Dad also had a brand new custom jigging rod with him, and it was our duty to break it in properly... Luckily, the fish cooperated pretty well. We didn't catch any giants on our trip, but the numbers were half decent. We ended up with about 15 to 20 bass between the two of us, and 5 walleyes as well. On Wednesday, I had to attend some training for work... but I was able to stop along the river for a quick trip on my way home. Luckily the bass cooperated pretty well in the short time I had to fish. I hooked six bass in all and landed three, which came on a new soft plastic that I have been trying out lately and have been very happy with. As the title of this entry indicates, spring really is just around the corner. 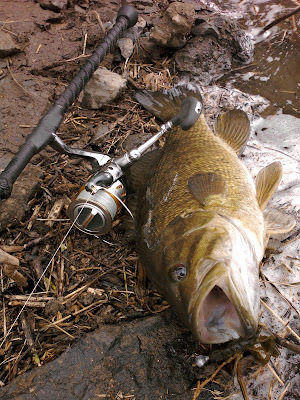 So if you like to catch smallmouth bass, the next couple of months can provide some of the best action of the year. Wait for some stable weather (like we've been having lately), a warm afternoon, and get out there and hit the river. Bass will be in the pre-spawn mode, and this can be your best opportunity to pick up your heaviest fish of the season. 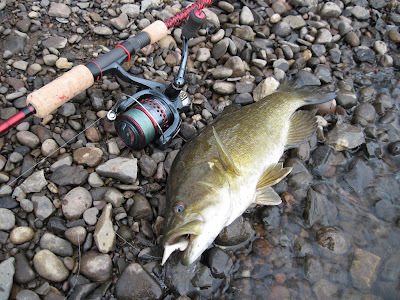 Just treat them nice, as they are fat and full of eggs... With our local smallmouth population down somewhat, we need to do our best to encourage healthy spawns in our river system. So good luck out there. Hope to see you on the water.